Darlings, in the left corner you will find Miu Miu’s decadent Desert Suede Studded Platform Slingbacks – the very same ones seen countless times on Jessica Simpson; to the right feast your eyes on BCBGeneration’s blissful Blend Sandal. While the platform of the BCBGeneration’s is a darker shade of wood than the blonde seen upon the magnificent Miu Miu’s; for just $110.00, as opposed to the $495.00 required to add the Miu Miu’s to your shoe collection, they are every bit as chic as their haute couture counterparts, allowing the frugal fashionista a splash of star style without breaking her budget! In general I have darker clothing so I would LOVE to own those BCBGeneration ones!! I love that store. I can sometimes really find a great deal!! I'll definitely take the steal! Eh. I can take or leave either of them. I haven't totally embraced platforms yet but BCBG for sure if I did! What an awesome find! And I think I even like the BCBG ones better!! i would have to go with the miu miu ones, they are too cute!! It's like before and after to that picture hehehe.. I actually really love both of these and would be thrilled with either pair! That's odd. These shoes are screaming my name. Do you hear that??? I am a total sucker for Miu Miu shoes, so I think I'm going to have to splurge this time! I love the slingback feature on a cloglike shoe. Makes is more dainty. Definitely not splurging. Trying to save up for the perfect pair of boots! These stiletto rocks! I would love to have one also. Unbelievable! So alike. Great find. These are so pretty. Great, there is a cheaper and more reasonable priced one. I think in this very close comparison I could do either! They both look good!! Love the sandals and I can barely tell the two apart! Ooh, you've done it again! Bravo on finding another budget-friendly pair of shoes! I love them, but I would die in them. The bargain pair is fab! I looove them! 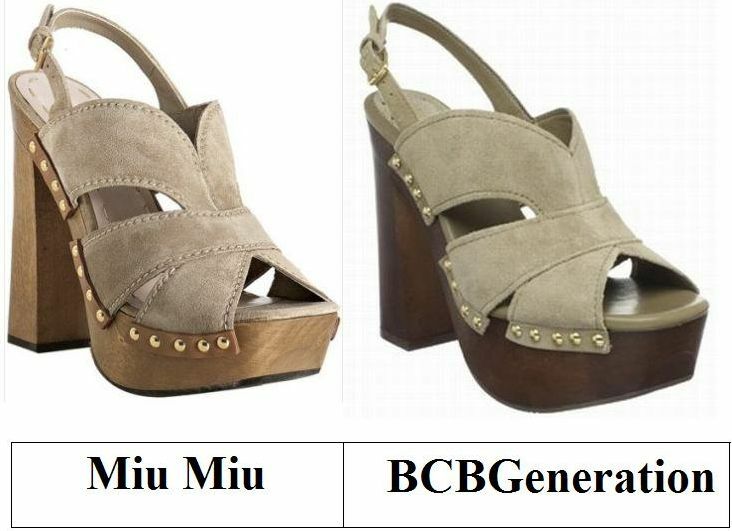 I would definitely go for the BCBGeneration ones. I'm naturally just a fan of darker colors, unless we're talking shirts. Then, I would get really experimental. Lovely find, E. They look exactly the same. Hope you have a good Thursday. I more than happy to go with the BCBG. I love pretty much everything from there! I would love to have a pair of them...but I highly doubt I'd have any use for them...except falling in them. I wear flats all the time now. Someone explain it to me please! I love bith pairs such a great versatile colour. As usual I would go for the cheaper ones as I just can't resist a bargain. They look identical. Who could knock back a pair of Miu Mui's though. oh my gosh, they look exactly alike! I actually like the color of the BCBG ones better! I actually like the darker ones more. Not a huge fan of chunky heels or studs BUT the strappy look is making me long for warmer months. I would wear these every day if I could have warm weather back! That is a great deal - I'd totally go with the less expensive! I actually prefer the color of the heel much better on the BCBG pair :) Another great find!! Awesome tip! Definitely going to go for the BCBG one! Thanks for posting this! They look like great summer shoes. I agree with Tanvi though: they're not my style. I like the studs though. I love them both, so I will go with the cheaper for sure! So cute! nice stuff <3 you totally rock, tons of thanks! BCBG...I couldn't shell out that much for the Miu Mius! awesome find! these are super identical. Another great find Erika! If only I weren't tall already, these would be the perfect spring shoe for me. Wishing you a wonderful weekend! the BCBG pair are so similar to the miu miu pair! I love them. The shoes are great! I hate color brown but now I guess I'm already starting to like it. LOve it!